This painting is not mine, I bought it. When I was at the workshop last week, it coincided with Langley's first Saturday art walk. I visited Studio 106, which is the working studio of 3 wonderful artists: Faye Castle, Phyllis Ray, and Barbara Barry. 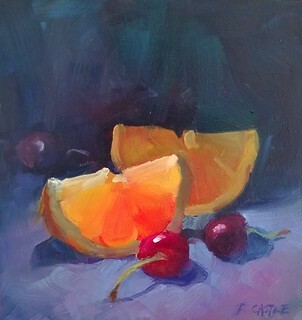 While in the studio, I was so attracted to this 6x6 painting by Faye Castle that I bought it! The color and light in the painting is so good.